If it weren’t for the sign in the window advertising ‘Rehearsal Space Slots from £15’, you could easily walk past Dalston’s Power Lunches Arts Café without noticing it for what it is: one of the fastest growing hubs of the Hackney music scene. Once inside, though, all becomes clear. Despite the full menu of fresh food and drink, the real passion here is music. With gig posters covering the walls, stacks of vinyl adorning the bar, and a miniature record store in the front, Power Lunches is designed to be a place that Hackney’s music community can call home. 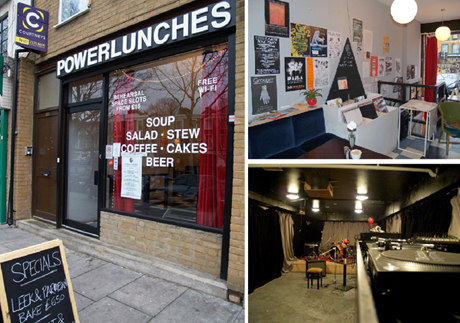 Since it opened in July, Power Lunches has sought to change that. In the day, it operates as a café upstairs and a rehearsal space downstairs. At night, the rehearsal space becomes a music venue, hosting local bands mostly, but also acts from around the UK and beyond. The response has been fantastic. Although gigs were originally planned for only Friday and Saturday nights, the demand from artists, promoters and fans has been so great that Power Lunches will soon be hosting live music four or five nights a week. With that in mind, Dorrer wants the space to be open to all varieties of artists and fans. When I popped by, I had the chance to watch New Noveta, an experimental noise and performance art duo, as they were recording. The two discovered Power Lunches at a gig, but quickly came to appreciate it as a space to rehearse and record. “There’s nowhere else this cheap,” they said.